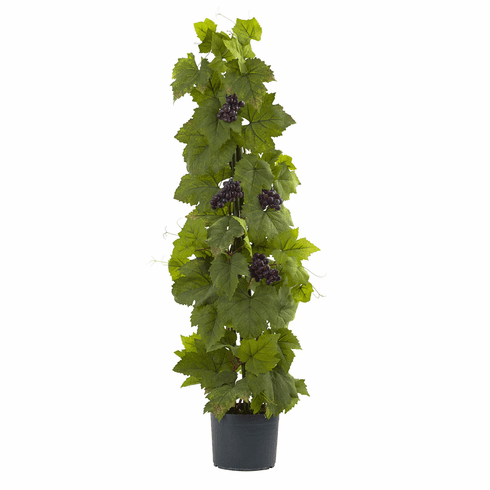 A beautiful selection to be sure, this grape leaf climbing plant stands at 40” inches tall, making it ideal for almost any location. Delicate bunches of faux grapes are spaced freely throughout the plant, adding that just right amount of color to the already beautiful greenery. This makes a great gift for those who enjoy something a little exotic... or you could always just keep it as a treat for yourself. Height: 40 In. Width: 15 In. Depth: 14 In. Color: Pot Size: H: 5.25 In. W: 6.25 In. D: 6.25 In.